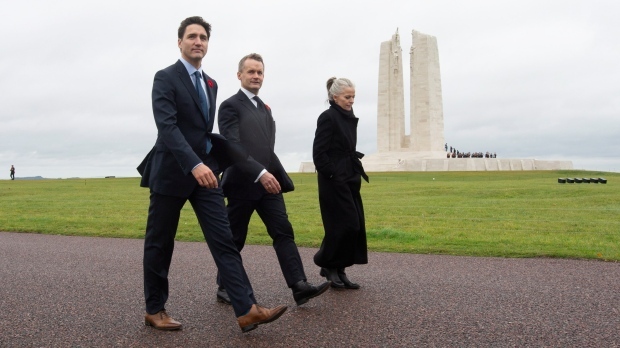 Minister of Veterans Affairs and Associate Minister of National Defence leads Government of Canada delegation to Belgium to mark the 100th anniversary of the end of the First World War. MONS, Belgium, Nov. 8, 2018 /CNW/ - The efforts of Canadians during the last hundred days of the First World War helped bring peace to the world at the end of what was then known as "The Great War." The sacrifices and achievements of those who gave so much to help liberate and bring freedom to the world will never be forgotten. Exactly a century after the Canadian Corps liberated the town of Mons, Belgium, in the hours before the Armistice was signed, Canada will play a key role in commemorating the end of the First World War. The Honourable Seamus O'Regan, Minister of Veterans Affairs and Associate Minister of National Defence, will lead an official Government of Canada delegation to Belgium to take part in ceremonies and events marking this milestone anniversary from November 9 to 11, 2018. The delegation will include Canadian Veterans, youth, and parliamentarians as well as ceremonial support from the Canadian Armed Forces and the Royal Canadian Mounted Police. A contingent of the Canadian Armed Forces made up of regiments with a connection to those that fought in the closing battles of the war will be featured prominently in many events in Belgium and France during this period. On November 9, the Government of Canada will host a special Tribute to Canada's Fallen Heroes at the Canadian National Vimy Memorial. This commemorative candlelight ceremony will include placement of candles by the public, musical and ceremonial performances by the Canadian Armed Forces, an Indigenous spiritual ceremony and dance, and an animated projection of some 66,000 falling poppies and maple leaves on the Vimy Memorial in honour of the Canadians and Newfoundlanders who gave their lives during the First World War. On November 10, the Belgian Municipality of Le Roeulx will honour Canadian Private George Lawrence Price, who is believed to be the last Canadian soldier to die in battle during the First World War, by inaugurating a new monument in his honour near the place where he fell in November 1918. On November 11, the City of Mons will hold a Liberation Parade honouring all those who fought in the First World War and especially the Canadian soldiers who freed their city on that same day a century before, in 1918. "It is an honour to join Veterans from regiments who, one hundred years ago, were on the front lines during Canada's Hundred Days. We will walk the same paths that those regiments did and we will remember the Canadians who liberated villages and towns all across Europe's Western Front all the way to Mons on November 11, 1918. The people of Belgium have never forgotten the sacrifices Canadians made and neither will Canada." The Government of Canada is improving the transition of Canadian Armed Forces members, veterans, and their families from military to civilian life by ensuring there is a full range of support and services available to them. The Honourable Harjit S. Sajjan, Minister of National Defence, and the Honourable Seamus O’Regan, Minister of Veterans Affairs and Associate Minister of National Defence, today announced the stand up of the Canadian Armed Forces Transition Group. The creation of the Transition Group is a key aspect of improving the transition experience for Canadian Armed Forces members and their families; it will ensure that members begin to think about transition earlier in their careers with leadership guidance and mandatory training that will make them feel equipped, confident and secure to plan and prepare for life after service. The new formation will deliver personalized, guided casualty support and transition services to Canadian Armed Forces members, veterans, and their families, with special care and attention to those who are ill and injured. In collaboration with key partners, including Veterans Affairs Canada, the Transition Group will design a renewed process with a goal of assisting Canadian Armed Forces members in their journey throughout their career and beyond. The stand up of the Canadian Armed Forces Transition Group introduces the launch of the Transition Trial at Canadian Forces Base Borden, a pilot project that will assist the Canadian Armed Forces Transition Group in developing the professional, standardized, and personalized approach to transition that will eventually be put in place across the Canadian Armed Forces. The stand up of this Transition Group is also an important step in ensuring a seamless transition for Canadian Armed Forces members, veterans, and their families to life after service. In the same way, it also responds to the commitment made in Canada’s Defence Policy, Strong, Secure, Engaged to better support members as they transition to post-military life. Today’s announcement comes with the launch of the Military Career Transition portal on Canada.ca, where members, veterans and families can access information on support and services throughout the transition process, including a new online Transition Guide. I wonder when they will have a program for RCMP Officers who are transitioning to civilian life.